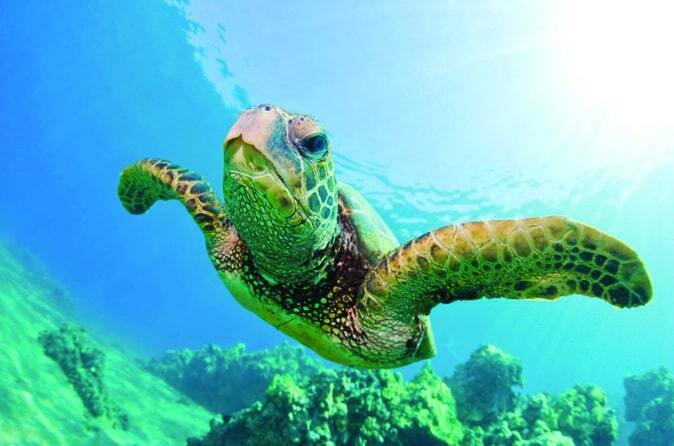 On this turtle snorkel cruise, if a turtle is not sighted, you will be given a complimentary return turtle snorkel cruise. 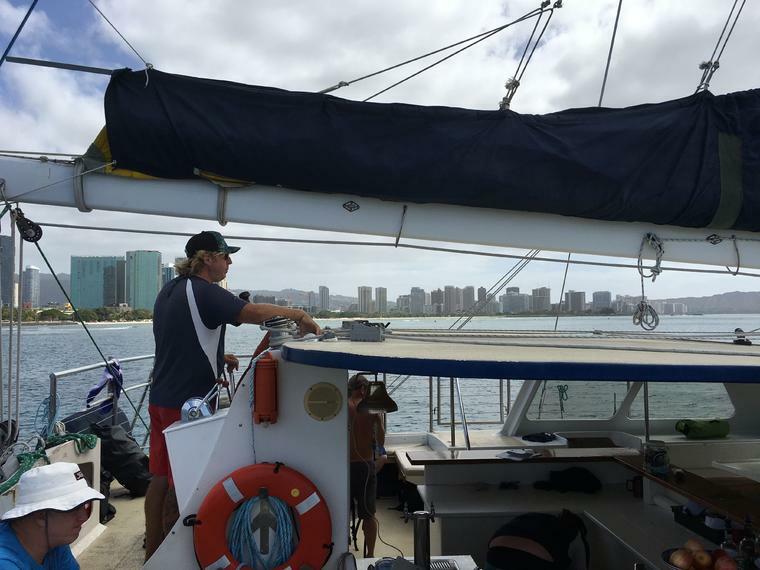 After departing Kewalo Basin Harbor in Waikiki, relax aboard the luxury, 53-foot (16-meter) catamaran Honi Olani. With seating for up to 49 passengers, the sailboat features a bar where you can use your two included drink tickets, plus order unlimited nonalcoholic beverages and provided snacks. You may also purchase additional alcoholic drinks; on offer are draft beer, sparkling wine, white wine, vodka, rum and whiskey. Listen to music on the surround-sound stereo as you enjoy a scenic 15-minute cruise along the coast toward Diamond Head. View Waikiki Beach from the water, and keep an eye out for marine wildlife. During whale migration season (December through April), your captain makes a stop so you can catch sight of these majestic mammals. 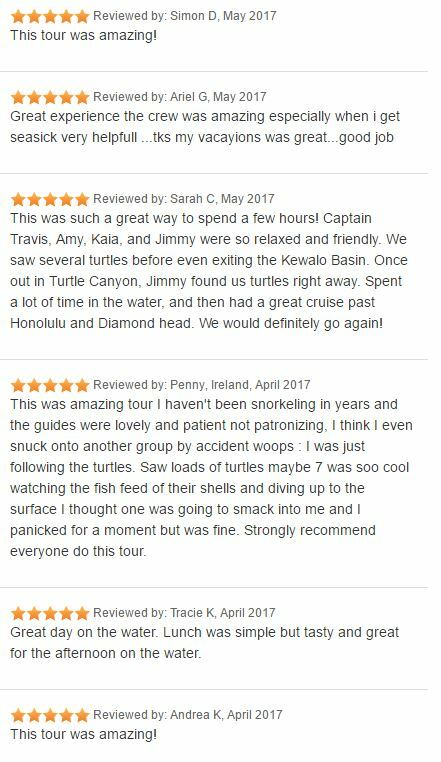 When you reach Turtle Canyon, where Hawaiian green sea turtles are almost a guaranteed sight, put on your provided safety vest and snorkeling gear, and slip into Oahu’s azure waters via a safe stairway. You have about one hour to spend on a guided snorkel adventure if you’ve selected the morning tour, or an additional 30 minutes in the water on the midday tour. Afterward, you’re free to make use of the full restrooms and freshwater shower back on board the catamaran. Then take a seat inside the covered cabin for a build-your-own-sandwich buffet lunch (midday tour only), or relax in the ample outdoor space to snap photos of the Waikiki skyline with the Ko’olau mountains in the background. Sample lunch items include ham, turkey, cheddar cheese, pepper jack cheese, lettuce, tomato, onion, chips, cookies and snack mix. Your tour ends with return to the harbor.